If your computer is not detecting your iOS device, then it because of the driver. Follow the guide to install iPhone drivers on Windows 10 computer automatically and manually. 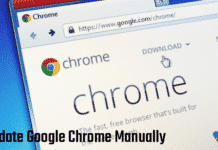 While connecting your device, if you are getting an error that Windows 10 doesn’t recognize iPhone or other iOS devices, then probably your system doesn’t have the right driver to detect the hardware. I have also covered the topic on best driver updater for Windows computers. Well, before going to the solution you should know the real reason behind this problem. iTunes is the official software by Apple Inc. to transfer files on iPhone, iPad or iPod Touch devices. There are two ways to install iTunes on your computer. 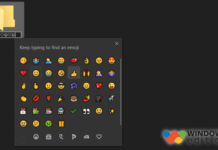 Either you can download it from the official website or install it directly from the Windows Store. The problem is, iTunes form the Windows Store doesn’t come with the drivers, that’s why you face iPhone not showing up in iTunes in Windows 10. In case you installed iTunes from the Microsoft Store and your device is not detecting, then there are few different ways to install it. Let’s know how to do it. 1. First of all, connect your iPhone to your Windows 10 PC. 2. When you get the error that, “driver not installed” navigate to Windows 10’s Settings → Update & security → Windows Update. 3. Here, click on “Check for updates” button. Windows will automatically download and install two small iPhone drivers on your computer. 4. Once the drivers are installed, restart your PC once to work them perfectly. Once you come back, you’ll not face any issue regarding the drivers. 1. 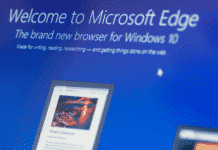 All you need to do is, connect your iPhone to your Windows 10 computer. 2. 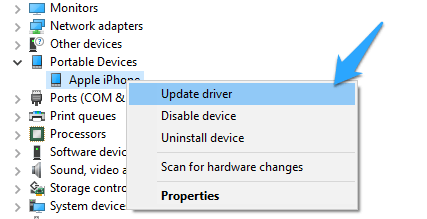 Now, right-click on the Start menu and select Device Manager option. 3. In the Device Manager window, look for Portable devices and expand the entry to see Apple iPhone option. 4. After that, right-click on Apple iPhone and then click Update driver option. 5. 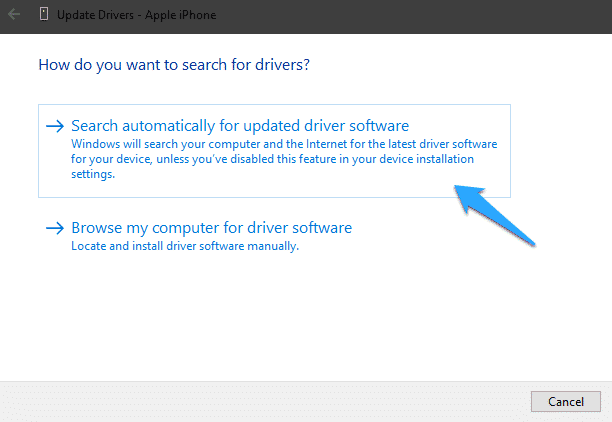 Finally, click on Search automatically for updated driver software option to let your computer automatically install the required drivers for iPhone to run on Windows 10. That’s it. In case you installed iTunes from Apple’s website, but still, your computer has not installed the proper driver for your computer, then you can apply this fix to solve the “driver not installed” error. 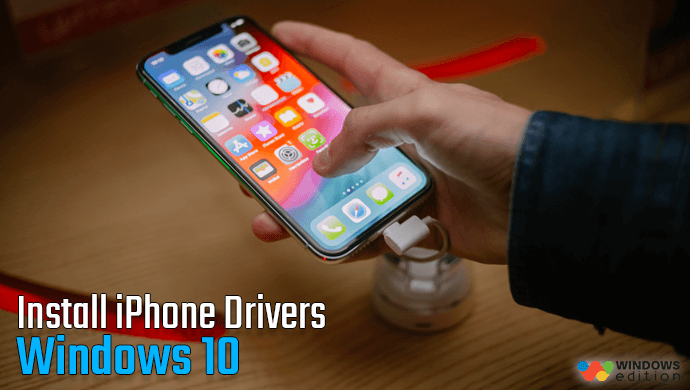 In order to install iPhone device driver on Windows 10, connect your unlocked iPhone to your computer. 1. Press Win + R to open the Run window. 2. Type the below command in the box and press Enter to execute it. 3. It’ll take you the Drivers folder for your iPhone/iPad/iPod Touch. 5. Finally, right-click on that file and select Install. That’s it. 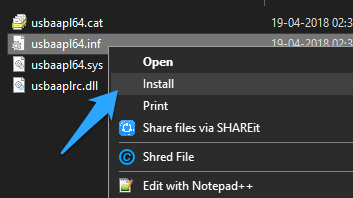 You have to install any of these files with .inf extension. Once done. Restart your PC, and you are ready to go. After applying all these above methods, if your iPhone is still not showing up, then probably the Apple Mobile Device Service has been stopped by some reasons. To restart it again, follow the below steps. 1. On the Start menu, search for “Services” and open it. 2. On the Services window, look for “Apple Mobile Device Service“. 3. 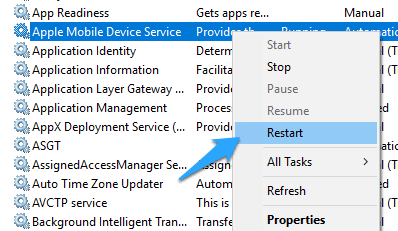 Right-click on the service and select Restart option. That’s it. After that, you have to restart your computer once, and the problem is gone. These are the different ways to install iPhone drivers in Windows 10 computer. After trying these above steps if iTunes is not recognizing iPhone in Windows 10, then let me know. I’ll try to fix the issue. If you found it useful, then don’t forget to share with your friends.